Review date: 2 June, 1999. Sheetfed scanners, which pull a page past a stationary scan head, are a trade-off. They take up a lot less desk space than a standard flatbed model, and ones with a proper document feeder are great for multi-page scanning. But you can't scan anything but individual sheets of paper or card in a sheetfed scanner, and the scans you get are often not as good as those from a flatbed scanner, because the scan mechanism is likely to have lower specifications, and because the paper feed mechanism may have a hard time keeping the document straight. Avision's AV100C is a sheetfed parallel port scanner (which means it won't work with a Macintosh) that retails for $329 (Australian dollars). It can scan in 24 bit colour, with an optical resolution of 300dpi (dots per inch) and mechanical resolution of 600dpi. These statistics put it slightly below the level of Avision's cheap-as-chips AV260C flatbed (reviewed here), which currently sells for only $139. The somewhat slower but rather better AV620C (review here) is only $189. So why should you spend the extra? Essentially, if you don't want to do OCR (Optical Character Recognition), you shouldn't. But if you need to turn a lot of documents into text files with a flatbed scanner, you'll need to buy a separate sheet-feeder or put up with a whole lot of page-swapping. Most cheap flatbeds, including the two low-cost Avisions, have no sheet feeder option. 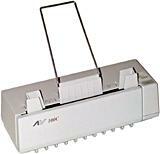 A scanner like the AV100C, however, pretty much is a sheet feeder, with a small parasitic scanner attached to it. The 100C's feeder can hold up to 10 pages - maybe more, but you're asking for trouble - which means, in theory at least, one-tenth as much page swapping. The AV100C looks much like most other sheetfed scanners. The body of the scanner is 90 by 290 by 110mm (3.5 by 11.5 by 4.25 inches), with the clip-on sheet feeder elements sticking out of the top. The front hinges open to clear jams and let you clean the rollers and scan head, but that's about it for twiddly bits. As with Avision's other cheap scanners, there's no power switch; when the lightweight 12 volt AC adaptor's plugged in, the scanner's on. The back of the scanner has two female parallel connectors, unlike the female and male on the other Avision parallel models. The connectors serve the same function; one connects to the computer via the provided cable, the other is a passthrough for your printer, which should work as normal provided the scanner's powered up. For the scanner to work at a reasonable speed you need a somewhat recent motherboard with a bidirectional parallel port - EPP or ECP preferred. This is not a new feature; every PC since the later 486 days has had such ports. The scanner comes with a basic setup guide on paper, but there's a complete manual in Adobe Acrobat format on the included CD-ROM. The CD manual is perfectly adequate, although it won't win any awards. The side of the AV100C box is far more entertaining; it features a marvellous slab of Chinglish, of the sort that used to be standard on Taiwanese peripherals but is now sadly rare. Apart from the manual, the CD also contains the same software bundle as comes with the cheap Avision flatbeds. You get a TWAIN driver for all versions of Windows, a dedicated image acquisition and management program called PaperCom, and Xerox's decent TextBridge 2.0 Optical Character Recognition program. There's also MGI PhotoSuite SE, an image manipulation program that works passably well, but is hopelessly outclassed by more recent software like Paint Shop Pro. The most complicated thing about setting up the 100C is clipping on the bits of plastic for the sheet feeder, and that's pretty easy. Plug it into your computer, power up, stick in the CD and install the software. Flatbed scanners have a carriage lock you have to disengage before use, but not sheetfed models; this is about as plug-and-go as it gets. The TWAIN driver is the same funny looking but functional "Mr Scan" software as the Avision parallel flatbeds use. It's got automatic object-finding and manual gamma setting and all the other basic features, so I can forgive it its funny look. The AV100C's 300 by 600 dpi (if you choose 600dpi resolution, it makes up the other 300dpi of horizontal resolution via interpolation) and 24 bit colour are about as basic as scanners get, these days, which is a little disappointing considering its less-than-basic price. Realistically, though, 300 by 300 dpi is as high a resolution as you need for scanning even photo prints, which is the most demanding task a sheetfed scanner is likely to face. 30 or 36 bit colour would be nice, but most users won't miss it. In operation, the 100C hums and clicks as it feeds the paper, which was slightly annoying. It's decently fast, though; a 300dpi 8.5 by 11.7 inch greyscale scan, generating an 8.5Mb image, took only 50 seconds, which is about the same speed as the 260C flatbed. Pre-scans are more cumbersome, since you have to feed the document through and then put it back in the feeder for the final scan after you pick the part you want, but I was pleased at the 100C's accuracy; if you mark out an area on the pre-scan, and put the document back in the right way around (upside down, facing away from you) the scanner will give you what you expect to see, not a near miss. Like other parallel scanners, the 100C paralyses the computer while it does its thing, so its speed of operation matters. The 100C's white-page scans, like those of the other cheap Avision scanners, are unnaturally clean. This is because all of these scanners "clip" all of the very lightest shades of an image to white, removing the subtle lines and blotches that would otherwise mar the scans. This is no big deal, for a sheetfed scanner like the 100C, and not really a problem for any consumer scanner. Nobody's going to be doing high art scans on the 100C, and cleaner whites may help OCR accuracy a bit. When I tried out the 100C for OCR, it performed very well. It didn't feed pages crooked or grab two sheets at once, although it does seem to have a tendency to hang onto the last page it scans. It's easy enough to remove a "grabbed" page by popping the front door open. The only annoying thing about OCR scanning was that the standard TWAIN driver popped up and had to be manually set to 300dpi black and white before the scan proceeded. Well, "popped up" is the wrong term; it actually appeared behind the TextBridge window, making me think the Xerox program had crashed. After killing TextBridge, I found the errant driver window. Once that was sorted out, the OCR accuracy with TextBridge 2.0 was excellent. Not perfect, and poor on anything but clean black-on-white text in a non-weird font, but certainly as good as most people need, and a heck of a lot faster than typing things in. Here's a comparison of the 100C, 620C and 260C's results in a 300dpi scan of an obliging resident of my back yard. The 100C's results are maybe a little worse than the 260C's, and both of them lose out by a little to the 620C, but it's a close-run thing. There are no wiggles or funny colour casts in the sheetfed scanner's results, and overall I'm very pleased at how well it handled the photo. Of course, I couldn't do any 3D object scans, including the usual shiny-coin test, with the 100C, and it's this that represents a sheetfed scanner's major disadvantage - if you want to scan solid objects, or out of magazines or books, a sheetfed scanner's no use to you at all. The AV100C is somewhat specialised, like all sheetfed scanners, but it's not a bad unit for the money. Good resolution, good photo results, excellent OCR performance, reliable paper handling. It could stand to be cheaper, and the parallel interface can be painful for multi-page scans, but if you have to get paper documents into your computer on the cheap, the 100C's a good choice. ECP: The Enhanced Capabilities Port is the most capable flavour of parallel port. It allows printers and other peripherals that support the standard to send information back to the computer while the computer's sending data to them. An ECP port, however, requires a DMA channel to operate, which simpler interfaces don't. EPP: The Enhanced Parallel Port is faster than the old-fashioned one-way ports, which managed only 40 to 50 kilobyte per second transfer speeds and could only send data to peripherals, not receive. EPP supports communication in both directions at speeds from 400 kilobytes to one megabyte per second. Mechanical resolution: Sheetfed scanners pull a document past their scan head to capture its image. Since the document isnt changing, taking lots and lots of horizontal-line snapshots of it and sticking them together gives the same result as a far, far more expensive capture mechanism that could grab the whole image at once. The mechanical resolution of a sheetfed scanner is the smallest step by which it can move the document, and it thus determines the maximum number of these skinny snapshots that can be taken. Mechanical resolution does not have to be the same as optical resolution, and indeed isn't for the Avision parallel scanners, each of which has a mechanical resolution twice as high as its optical resolution. Since scans are done with one resolution figure for both directions, setting a scan resolution that's higher than the optical resolution but lower than or equal to the mechanical resolution will cause the scanner driver to fill in the gaps in the horizontal direction via interpolation. Optical resolution: A scanners optical resolution is the number of dots per inch (dpi) its scan head can detect. A scanner with 600dpi optical resolution and a scan head 8.5 inches wide, like the AV100C, has a scan head 5100 dots wide. 24 bit: Most cheap colour scanners are 24 bit; they digitise each of the red, green and blue channels with eight bit resolution, making a total of 24 bits per output pixel. 30 bit scanners add another two bits of resolution to each channel, increasing the number of distinct colours they can output from 16,777,216 (two to the power of 24) to 1,073,741,824 (two to the power of 30), and 36 bit scanners do 12 bits per channel, for 68,719,476,736 possible colours. This "colour gamut" increase is invisible to the naked eye, but it means the scanner can use only a portion of the colours it detects and still maintain full detail. If, for instance, you push up the brightness of the scan in the driver software by 20%, the top 20% of pixel values will all run "off the top" of the permissible output values, and become pure white. A 24 bit scanner, in this situation, has to stretch the remaining 80% of pixel values into a complete 24 bit gamut, reducing image quality, but a scanner with higher bit resolution should have values to spare.